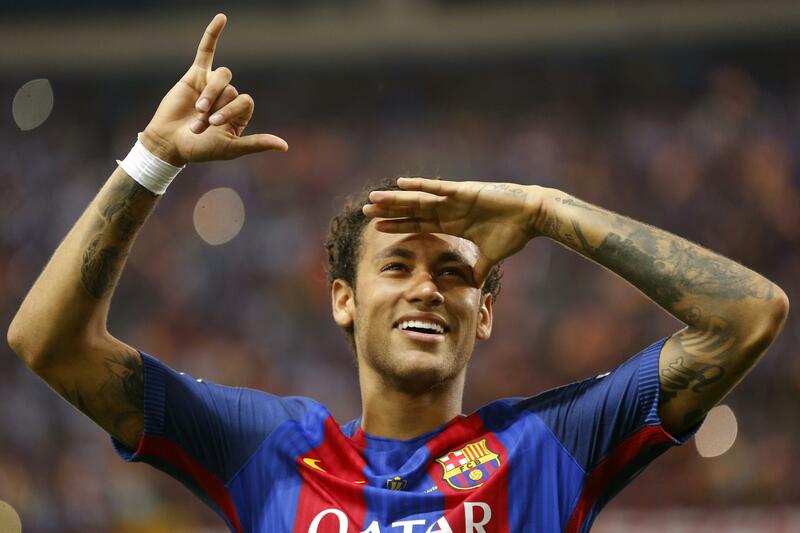 LONDON – Neymar’s move to Paris Saint-Germain has obliterated world soccer’s transfer record in a major coup for the French club – and the tiny energy-rich emirate of Qatar. By signing the Brazilian star for its flagship sporting asset, Qatar is projecting a business-as-usual image to foreign allies and investors after two months locked in a bitter diplomatic dispute with its neighbors. While a footnote in monetary terms in Qatar’s wider investment portfolio, the immensely wealthy 2022 World Cup host nation has long used sports as a way to elevate its stature . Signing one of the most recognizable and marketable figures in the sports world on Thursday is an extravagant demonstration of that. Meeting Neymar’s mandatory fee of 222 million euros ($262 million) is the most significant move yet to join the soccer elite by PSG as it prepares for its seventh season under ownership that is closely linked to Qatar’s ruling family. “They are trying to literally score a point here,” said Christopher Davidson, who teaches Middle East politics at Durham University in northeast England. “It sounds like a lot of money but given the stakes are hundreds of billions of dollars because of the World Cup, Neymar will be seen as a sound investment by Qatar. Qatar has been waging an international public relations offensive to fend off accusations by Saudi Arabia, the United Arab Emirates, Egypt and Bahrain that it supports extremists. Qatar strongly denies the allegation and sees the boycott by its regional rivals as a politically motivated attempt to change its foreign policy and undermine its sovereignty, with the natural gas-rich country’s only land border sealed off. Soccer stars have not been deterred from flying into Doha, helping to give the impression that the desert nation is weathering the boycott. The diplomatic row has bled into Qatar’s extensive sports empire in other ways too. An Egyptian soccer coach, Hossam el-Badry, who manages Egypt’s Al Ahly, was suspended and fined $10,000 by the Confederation of African Football for refusing to give interviews to the Qatar-based beIN Sports network following two games in the African Champions League last month. In the Gulf, many view beIN as remaining closely linked to Al-Jazeera, which was founded by Qatar’s former emir and is one of the country’s best-known international brands. Al-Jazeera previously operated sports channels that were rebranded as beIN Sports and beIN Media Group was spun off into a separate company in 2014. The anti-Qatar quartet has demanded that Al-Jazeera and other Qatar-backed media outlets be shut down as a condition of normalizing relations. Qatari officials have made a point of saying that the vast construction project for the World Cup has been unaffected by the blockade. But they have acknowledged that import costs overall have risen dramatically for items such as food and medicine, which now need to be flown in or shipped by sea from points further afield. While big-ticket assets like British department store Harrods can seem more financially astute investments for Qatar, sports entities and events enjoy a higher profile. Qatar hosted the 2006 Asian Games and the Asian Cup football finals in 2011, and stages annual tennis and motorcycle grand prix events. All those will pale in comparison to its controversial hosting of the World Cup in 2022 – the first time the FIFA showpiece will be held in the Middle East. The tournament, which will be played in eight stadiums across a country smaller than the U.S. state of Connecticut, is the centerpiece of footballing ambitions that were minuscule in Qatar before the FIFA vote. In 2004, it set up the Aspire Academy to train promising young Qatari and foreign players. State-backed Qatar Airways was named in May as a sponsor to soccer’s world governing body FIFA, and until the end of June was the main sponsor of Barcelona. Barcelona enjoys the global stature and track record of success craved by PSG, which is yet to win European soccer’s top Champions League title despite the lavish investment from Qatar Sports Investments. Linked to the country’s leadership, QSI describes itself as a “closed shareholding organization” that is chaired by Nasser Ghanim al-Khelaifi, a Qatari former tennis player who is also chairman and CEO of beIN. The sports network was caught up in the diplomatic dispute too, with its signal along with that of Al-Jazeera cut for viewers in the boycotting countries. That it seems was a step too far though. The UAE unblocked the network more than a week ago to the delight of fans in the seven-state federation that’s home to the commercial hub of Dubai. It will be through beIN that Neymar’s matches from PSG are beamed onto screens across the Middle East, following a transfer that provides a potent example of Qatar’s sporting firepower. “This signing can demonstrate that Qatar is still viable, still able to have international influence and still able to be serious player in international soccer,” said Davidson, the Middle East expert. Published: Aug. 3, 2017, 1:40 p.m.